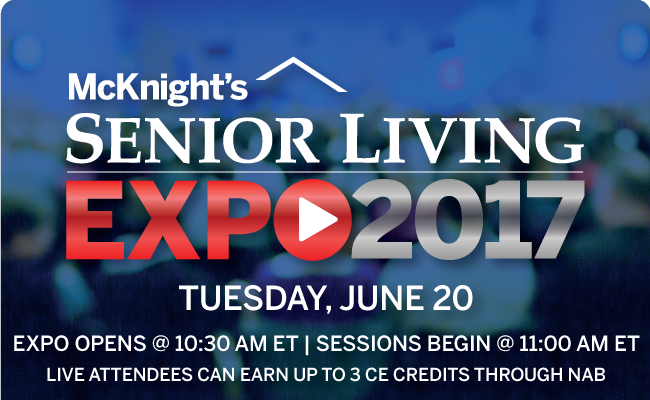 Registration is now open for McKnight’s Senior Living’s first online expo. Expo 2017, planned for June 20, will include three webinars, each certified for one hour of continuing education credit from the National Association of Long Term Care Administrator Boards for those who attend live. Attendees also will be able to network live with colleagues and vendors, visit virtual booths and learn about the latest products, services and industry trends at a virtual trade show. The expo will open at 10:30 a.m. ET, with webinars scheduled for 11 a.m., 1 p.m and 2:30 p.m.
For more information about the free event, and to register, visit this page.